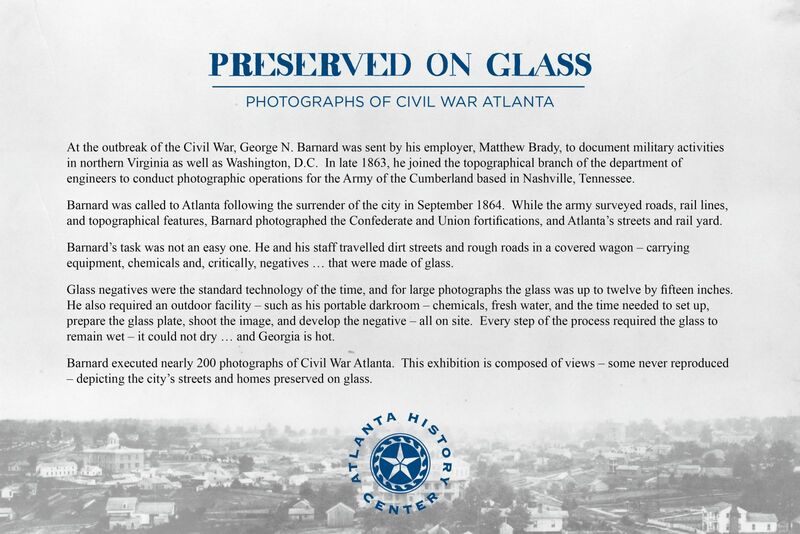 In honor of the sesquicentennial celebration of the Battle of Atlanta, the Atlanta Preservation Center is hosting this exhibit which shows rare photos of antebellum Atlanta. The exhibit is presented by the Atlanta History Center and curated by Michael Rose. A Union soldier stands guard on Washington Street outside the Sidney Root residence, which served as the headquarters of Union Major Edward Beckwith. The concrete house was built in 1858 for prominent Atlanta merchant Sidney Root, a native of Vermont. Despite his Northern heritage, Root was a slaveholder who actively assisted the Confederacy through financial and diplomatic support. The antebellum firm of Beach and Root was involved in cotton, dry goods, and banking, and constructed Atlanta’s first three-story, iron-front commercial buildings on Whitehall and Pryor Streets. Root was traveling in Europe in support of the Confederate States during the siege and occupation of Atlanta, and did not return to the city until after the war. Unlike his many commercial buildings, this house was spared the destruction of Sherman’s army. Root later sold the house to former Georgia Governor Joseph E. Brown. In 1883, Root began service as Atlanta’s city park commissioner and working with Lemuel P. Grant was influential in establishing Grant Park. This house served as headquarters of Captain Orlando M. Poe during the Union occupation of Atlanta. As Sherman’s chief engineer, it was Poe’s duty to oversee the destruction of Atlanta’s commercial, military, and transportation infrastructure on the eve of the Union army’s departure of the city. The house, built by local attorney Marcus Aurelius Bell in 1860, stood at the corner of Wheat and Collins Streets [now Auburn Avenue and Courtland Street]. The residence was constructed of plaster-covered stone marbleized in shades of blue, yellow, and red. Atlantans, however, believed the effect looked more like calico fabric than classic marble, thus the house’s nickname. The church with the picket fence in the foreground is Trinity Methodist, constructed in 1854. It faced Mitchell Street just south of Atlanta City Hall [now Capitol Square]. The congregation was founded in 1853 in the next-door home of Martha and Green B. Haygood. Their son, Atticus G. Haygood, later president of Emory University, pastored this church in 1864. The basement served as safe storage for personal belongings when Atlanta residents were forced to leave the city. The Georgia Department of Transportation Building occupies the site today andTrinity Methodist is located at the southwest corner of Trinity and Washington Avenues. Five Civil War-era churches existed in downtown Atlanta:: Trinity Methodist; Central Presbyterian and Second Baptist, both located on the west side of Washington Avenue; St. Philip Episcopal, located north of the Public Square; and Shrine of Immaculate Conception, located at the present site on the corner of Martin Luther King Jr. Drive [Hunter Street] and Central Avenue [Loyd Street]. Looking north on Washington Street, the home of Georgia State Supreme Court Judge Richard F. Lyon stands at the corner of Mitchell Street opposite Atlanta’s city hall [current site of the Georgia State Capital]. Some of the city’s finest residences were reserved for personal use by Sherman’s staff and officers while many lesser, abandoned homes where dismantled and the lumber used to build cabins for Union troops. Built in 1859 by John Neal, the Lyon residence served as Sherman’s own headquarters. Following the war, Lyon was forced to sell the house at auction when it was reacquired by John Neal. Never used as a residence again, it later served at various times as Oglethorpe College, Boys’ High School, and Girls’ High School. The building was demolished in 1928 to make way for the current city hall. The quarters of the 22nd guard, occupy the grounds of Atlanta City Hall. Erected in 1854 by Columbus Hughes, the building also served as the Fulton County Court House. The city became a comfortable refuge for Union forces, offering staff the luxury of residential homes while the troops enjoyed ample huts constructed of their own shelter-half tents combined with lumber, windows, doors, and other materials scavenged from local houses and businesses. Due to the limitations of his equipment, George N. Barnard, like other photographers of the time, did not photograph battles as they happened. Rather than photojournalistic action photography, his work is essentially landscapes and architectural shots. In fact, Barnard did not arrive in Atlanta until mid-September nearly two weeks after the city surrendered to Union forces. This house, located on Peachtree Street, shows damage both under the roofline and to the chimney at right – probably from shelling during the Federal bombardment of the city during August. The siege was horrifying for residents of the city. Sherman himself wrote to Massachusetts Infantry on the Grounds Massachusetts Infantry, Major General William T. Sherman’s provost Confederate General John B. Hood, criticizing him for defending the city “on a line so close to town that every cannon shot and many musket shots… went into the habitations of women and children.” Lt. Col. Alexander Von Schroder was the inspector general on the staff of Major General George H. Thomas. “A year before my marriage,” Richard Peters wrote, “I purchased from Samuel G. Jones his house and two-acre lot at the corner of Mitchell and Forsyth streets for the sum of $1400. There we resided and there all my children were born.” The daguerreotype of the house he purchased is the earliest known existing photograph of Atlanta. A native of Pennsylvania, Peters moved to Atlanta in 1846 – two years before he purchased this house – when he served as principal assistant to J.E. Thomson, the Georgia Railroad’s chief engineer. Thomson is the man credited with coining the term “Atlanta” to replace the town’s previous name, Marthasville. “I sold this property,” continued Peters, “for the sum of $18,000 and we removed to Peachtree Street after completion of our new home.” Peters also bought 400 acres north of the city in the 1850s. This forested land was intended to be cleaned and the timber used as firewood for his flour mill. What was once Peters’ timberland is today the sites of the Fox Theater, the Coca-Cola Company, the Biltmore Hotel, and Georgia Tech. Guarded by a sentry and showing evidence in the left foreground of the defense works surrounding Atlanta City Hall, the William Solomon residence on Mitchell Street at Crew Street [Capital Place] served as the Union Army’s post headquarters during the occupation. Solomon, from Zebulon, Georgia, was a private banker and realtor with a local reputation as a successful gambler. He died in 1874 following a fall from a second-story window at his home, reportedly while trying to close the sash. The door stands partially open to an underground shelter on the site of the Charles E. Grenville flour mill on Brotherton Street. The city residents who could, built bomb-proof structures or “pits” such as this in their gardens or hills to escape the artillery bombardment during Sherman’s siege of Atlanta. Atlanta resident Lucy Caldwell used the pit in her neighbor’s yard, which was dug six feet in the ground and covered with timber and earth. “Within was laid a carpet and a few chairs,” she recalled, “thither we would go, when the shelling began.” Even the embankment of the secluded Walton Springs, once the fashionable promenade spot for city residents, became home to caves dug into the surrounding hillside. In early November 1864, Barnard produced a large number of views in downtown Atlanta. Looking up muddy Decatur Street, the Trout House hotel and the pedimented Masonic Hall stand at right. The white picket fence running along the street at left marks the edge of the Public Square, Atlanta’s first city park space. The General Passenger Depot stood just across the park from Decatur Street. The Trout House, constructed by Jeremiah Trout in 1854, was the city’s largest hotel and served as the reception site for Confederate President Jefferson Davis’ visit in 1861. In addition to the city’s military and production facilities, the Trout House was also slated for destruction by the Federal army. The Crawford, Frazer & Co. slave market at left was located at No. 8 Whitehall Street [now Peachtree Street], just one block from the rail line. Atlanta resident L.C. Butler remembered the benches surrounding the room on which slaves were seated. “Here,” he said, “the prospective buyers made their selections just as they would have a horse or mule at a stockyard.” The site of the slave market is now the location of the Five Points MARTA station. Beyond the rail lines crossing horizontally across the image, Union soldiers congregate on Peachtree Street around the Georgia Railroad & Banking Company Agency building. The bank, chartered in 1833, was constructed in 1856 and was destroyed when Sherman evacuated Atlanta on the March to the Sea. The Atlanta Daily Intelligencer newspaper office was located above Wittgenstein’s saloon stood at the corner of Whitehall Street and the railroad tracks. Founded as the Madison [Georgia] Southern Miscellany in 1842, the Intelligencer was the only newspaper to survive the war. Published by Judge Jared I. Whitaker, the newspaper lost many of its readers and advertisers because of its Reconstruction views, forcing it to close in 1871. Union troops sit atop boxcars on the rail line next to the Atlanta Hotel. In the distance, rises the pediment of the Masonic Temple. The roof line at right, just above the locomotive, is the Macon & Western Railroad’s station built by Thomas Cruselle. The station was known as the Rock Depot to distinguish it from the brick construction of the Union Passenger Depot, or Car Shed, the Western & Atlantic Railroad’s station. Thomas George Washington Cruselle was the contractor who built the first house on Decatur Street and erected the original Western & Atlantic Railroad bridge across the Chattahoochee River, as well as the Calico House. The group of soldiers at the lower center of the photograph is standing around a stereoscope-on-stand for viewing stereo photographs. Erroneously identified by Barnard as Marietta Street, this view looks down Alabama Street from the corner of Whitehall Street [now Peachtree Street] toward the Georgia Railroad locomotive house. This area is now the heart of Underground Atlanta. This section of the city suffered shelling during the siege of Atlanta. Solomon Luckie, a free African American businessman, was one of the city’s civilian casualties when he was struck by shell fragments standing at this corner. The fragments had been deflected when they hit the lamp post pictured here. The lamp post still stands after it was returned to its original location in Underground Atlanta. This view is taken looking south on Whitehall Street in Atlanta’s central business district. A lamppost at the corner of Alabama Street signifies the city’s progress; Atlanta obtained gas lighting in 1856 with the incorporation of the Atlanta Gas Light Company. The large top hat on the right side of the street advertises J.M. Holbrook’s store. Holbrook offered men’s hats, caps, straw goods, and trunks, as well as canes and umbrellas. From early Atlanta to the mid-twentieth century, Whitehall Street served as the city’s central business district. As a result of this commercial importance, everything in this photograph was destroyed prior to the Union army’s departure from Atlanta. The explosion from the city’s gas works helped spread the fire that devastated much of this part of the city. A pump and watering trough stand at the intersection of Peachtree Street and Marietta Street at what is today Five Points. The rail lines, commercial buildings, and bank at right are emblematic of Atlanta’s commercial importance to the Confederate war effort. The city’s manufacturing output expanded during the war, often incorporating production facilities from Nashville, New Orleans, Memphis, and other captured cities. Thanks to the city’s extensive rail lines, running north, south, east, and west, Atlanta became the center of a fabrication network uniting manufacturers from Selma, Columbus, Macon, Augusta, and other Southern industrial cities. Three officers on the staff of Major General George H. Thomas pose on the porch of an unidentified house probably located on what was known as “Upper” Peachtree Street, the section between Ellis and Butler Streets. Thomas’ own headquarters was located in the Herring-Leyden House near the intersection of Ellis and Peachtree Streets. Subsequently, many of the homes in the area were appropriated by officers of Thomas’ Army of the Cumberland. Left to right: Colonel A. J. Mackay, chief quartermaster; Brigadier General John Milton Brannan, artillery reserve; Dr. George E. Cooper, medical director. All reproductions in the exhibition are from the collections of the Kenan Research Center at the Atlanta History Center. Copies of these and other images by George N. Barnard, as well as a large collection of other Civil War images, maps, prints, and graphics are available for research and for photographic print reproduction orders.